You can tell a lot about a person from their eyes. If a smile reaches a person’s eyes, psychologists call that a Duchenne smile, which people classify as genuine. Healthy eyes are seen as a sign of beauty, vigor and wisdom, but the sparkle in your eyes also is affected by your health and nutrition. So it makes sense to eat foods that will support and promote healthy looking and feeling eyes. If cartoons are true, then bunnies have great eyes. Lutein and Zeaxanthin carotenoids are known to support eye health, according to Nutrients, an open access nutrition journal. Carotenoids are a pigment inhibitor which gives certain fruits and vegetables an orange or yellow color. Yes, carrots are in this category as are cantaloupe, corn and yellow peppers. Lutein and Zeaxanthin carotenoids have been linked to a reduced risk of macular degenerative disease and cataracts. They also serve to filter out damaging blue light, which gives the eye that shiny, sparkly appearance of health. However, carrots are not the best source of carotenoids but rather kale, basil and parsley top the list. If you have a hard time getting enough vitamins through your food, try a vitamin supplement like Lipotriad. You can purchase this supplement as well as a variety of others online through Vision Direct. 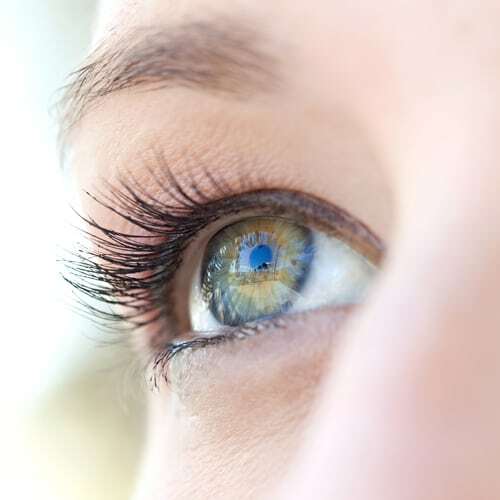 The micronutrient Vitamin A cannot be produced by the human body so it needs to be included in a healthy diet, says Community Eye Health Journal. One of the responsibilities of Vitamin A is to promote healthy skin, which includes the surface of the eye. Get the appropriate amount of Vitamin A to keep the skin of the eye healthy, which is especially helpful for contact wearers. Vitamin A is found in dark green leafy vegetables like spinach and shard. Bioactive lipids are a form of fatty proteins that have been linked to preventing, delaying or treating diseases such as cancer, immune disorders and eye disease. Because lipids are a special form of fat and tend to become rancid rapidly, food manufacturers have found it difficult to artificially include them into convenience foods and beverages that may not be eaten in their fresh or natural state. Oily fish like salmon is a good source of bioactive lipids, or for those that do not eat fish, algae and other sea harvested plants tend to be high in bioactive lipids. Taking dietary supplements is a common but ill researched area. Should you take your vitamins in pill form or are they a waste of money? Most people take supplements to maintain overall, sparkly-eyed good health, states JAMA Internal Medicine. For some things, it is simply easier to take a pill and be done with it. For instance, getting mega doses of Vitamin C by eating oranges would mean having 50 to 100 oranges a day. However, the general rule of thumb with supplements is to try and get all of your nutrients through food and add the pill as a little extra boost.